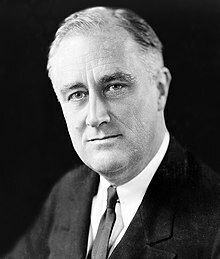 Franklin D. Roosevelt was famous as the thirty-second President of the United States of America and the only President to serve more then two terms. He led the nation out of the Great Depression and towards victory in World War II. He was born on January 30, 1882 in New York. And died on April 12, 1945 in Georgia. His life was full of actions, in 1933 he became for the first time president of the USA and stayed president until is death : 1945. He'll stay in the memory of all the american as the winner of the second world war. He did lots of things for his country to make it go out of the crises, before is election, 12 millions americans were unemployed and 2 million didn't even had a house. America was also a isolationist country who didn't want to take part in the second world war but he still prepared america to war a give lots of materiel to england to help them defend themself against the German. To recapitulate his life I would say that he's one of the greatest president that USA ever had, he make them winn the war and make usa go out of the crises. I hope that you enjoyed this article, see you soon !